Saturday night marks the UFC's first of many events in Brazil for 2019 and will feature a featherweight bout between former UFC/WEC featherweight champion Jose Aldo and Renato Moicano, who has rose up the rankings in the UFC’s featherweight division. Aldo will look to make a statement in this fight and ensure that he isn’t another stepping stone for Moicano’s rise to a title shot. Aldo is regarded by many as being the most dominant UFC feathweight champion of all-time; his title reign lasted six years and dated back to his days competing in the WEC and then the UFC, when the featherweight and bantamweight divisions. were added. In addition to Aldo’s dominant title reign, he had also been on an 18-fight win streak from 2006-2015, where he defeated some of the top fighters in the world including: Cub Swanson, Chad Mendes twice, former Ultimate Fighter runner-up Kenny Florian, former UFC lightweight champion Frankie Edgar twice, and UFC Hall of Famer Urijah Faber. The former featherweight king also made comments that will surely excite fans. After years of speculation as to whether he’ll would move up to lightweight, Aldo expressed a desire to do just that after his fight with Moicano, even mentioning Anthony ‘Showtime’ Pettis as a potential opponent after the two had been in talks to fight in the past. Pettis is currently scheduled to fight Stephen ‘Wonderboy’ Thompson at welterweight, so that fight may be a possibility later in the year depending on if both remain healthy. 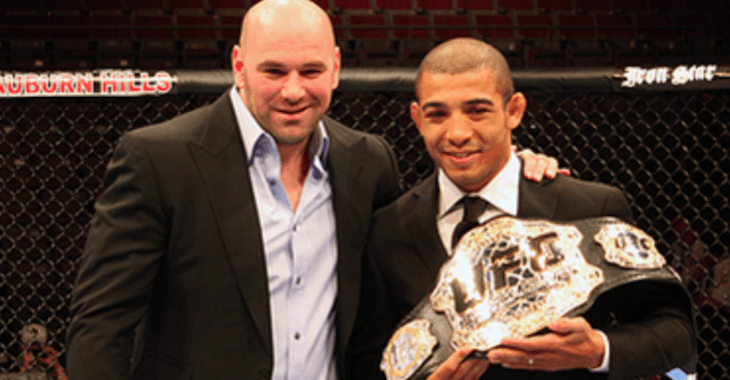 I feel that a move to lightweight could be the best thing for Aldo especially at this stage in his career. Much like other fighters, Aldo cuts a lot of weight to make the 145lb feathweight limit and at 32 years of age, that weight cut might not be as easy as it once was. Aldo could benefit without having to cut the extra ten-pounds and it may lead to a better performance. Taking into account Aldo’s fighting style, there are plenty of exciting matchups at lightweight if a fight with Pettis doesn’t pan out. The promotion could match Aldo up with somebody with a similar fighting style such as Justin Gaethje, Donald Cerrone, and Nate Diaz. These bouts would not only be great matchups, but they could also be big draws for an ESPN card or PPV card. because of the popularity of those involved and it would allow the UFC to have to rely on title fights sell their cards. Aldo also essentially confirmed that he’d be retiring from MMA when he finishes the remaining three fights on his UFC contract, likely at the end of this year. The 32-year old cited his health as the reason to retire this year because he wants to maintain his health, spend more time with his family, and not be forced to fight until 40. Regardless of what Aldo decides to do at the end of his contract, there is no doubt that he’ll be a UFC Hall of Famer once he decides to step away from the sport as an active competitor. Don’t forget to also check out BarnBurner’s ‘Ground and Pound’ MMA show on Saturday with Joe Peisich, Steve Carney of WDAE radio in Tampa, and myself, where we preview Saturday’s ESPN + card as well as the upcoming UFC 235 card in March.